Italy’s undisputed capital of fashion and design and the venue for Expo 2015, Milan renews itself practically every day, keeping one step ahead of the times. Modern edifices break up the continuum of older palazzi, churches and ancient monuments, proving that Milan is a coexistence of rather diverse architectural styles. 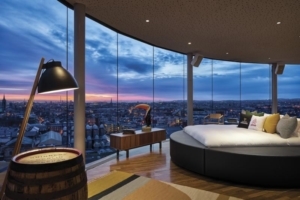 HOTEL VIU – 124-room property with the only hotel rooftop in Milan with an outdoor swimming pool and stunning 360-degree views of the city skyline. Immerse yourself in a world that challenges all the senses. A bold building, spectacularly framed with living greenery and set in the up-and-coming Porta Volta/Garibaldi area of the city, the perfect setting for a swim, for breakfast, or for an evening “aperitivo”. Guests and locals alike are also drawn to the culinary wonders of Michelin-star Chef Giancarlo Morelli, whose explosive energy and inspired sensitivity are behind the eclectic and unmistakable “signature” gourmet Milanese dishes at the hotel’s restaurant bearing his name, which offers an exclusive area within the kitchen for 12 people to enjoy an up-close gastronomic experience. The Modern Art Gallery is a real treasure in the city, they have an awesome collection from the 19th and 20th centuries. Don’t miss it! And after some nourishment for the spirit is time for some real food and you can reward yourself with great Sicilian cuisine at the LùBar café. 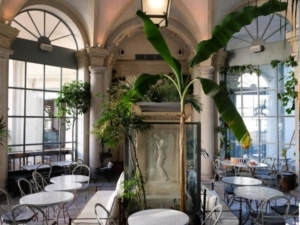 The cafeteria is located in the southern portico of Villa Reale, where once there were carriages and today there is a wonderful winter garden full of plants and Parisian atmosphere. This oasis is a real melting pot of cultures: tables, chairs and vases come from Morocco, while the counter tops are from Berlin but do not be fooled by their appearance: they look like they are made from precious stone but are in fact recycled plastic! There is also a kids space with mini Kartell chairs. The food is typically Sicilian, a real treat for the senses.It’s a trendy place to socialise with a lovely relaxed atmosphere. It will open in July 2017, offering 300m² of multifunctional space. A new location in the heart of Milan, this beautiful terrace will offer views of the Porta Nuova skyline on one side and the Duomo on the other one. We’re excited for the opening and feel this is the perfect location for dinners, parties and aperitifs! Stay tuned for more information and pictures in the next couple of months….